We veered off our usual school schedule to do other things today. The boys wrote letters to a friend who joined the Marines a few weeks ago and who needs some encouragement and prayer. 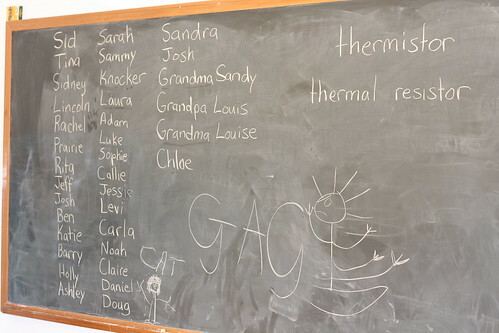 We listed all the Gaskins members expected to attend the festivities and quizzed the kids on Who was Who in the clan. They do well on the 21 “cousins,” but sometimes get a little fuzzy on the aunts and uncles, specifically which aunts/uncles are the sons and daughters of Grandpa and Grandma and which aunts/uncles are sons- and daughers-in-law. Over lunch, we played a little Gaskins trivia. They never guessed Aunt Rita as the oldest. “Who is Aunt Rita’s husband? Over supper, we reminisced over some family stories. And because they have heard the story so many times, the kids instantly recalled the first meal Aunt Rita cooked for her new beau, Jeff. Trying to impress him, she cooked her best —– macaroni-and cheese with cut-up hot dogs. According to Sid, Jeff the gourmet was not impressed. Now that I think about it. I’ve never heard Uncle Jeff and Aunt Rita’s version of this story. I wonder if it is different. My kids definitely know that Uncle Knocker has a different version of the field-on-fire story. According to him, Sid set that field on fire. According to Sid, Knocker set it on fire. Lincoln remembered that Cousin Sammy can burp anytime he wants to, which quite impressed him, until he realized that HE could pee anytime he wants to. I could see the mental gears shifting in his brain has he quietly decided that HIS skill was definitely just as good as Sammy’s. I’m sure the next few weeks will be filled with family stories as the anticipation of THE RELATIVES COMING builds.